Say goodbye to offensive key clashes when you're DJing. Being a successful DJ isn't just about matching beats - you need to make sure that the songs you're mixing don't contain obvious key clashes, too. 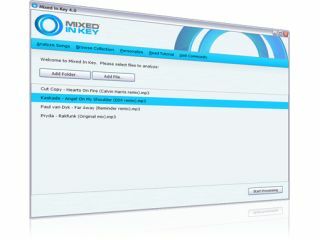 This is where Mixed In Key, which has just been updated to version 4.0, comes in. This handy utility analyses your digital music library and lets you know which songs will 'work' together harmonically. The new version offers an improved design and a better algorithm, so it should be even more accurate than before. You can now create playlists, and warnings are displayed when songs are flawed (eg, the volume is too loud, it's off-key or is likely to clip). Keyword support has been implemented. too, which should help you with your song searching. Endorsed by the likes of BT and Pete Tong, Mixed In Key 4.0 is available now for Mac and PC. It costs $58.